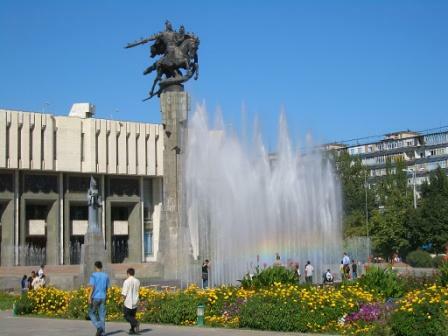 Bishkek is the capital of Kyrgyzstan, the largest city with the population of 850 thousand. Mainly the population of Tajikistan is the Russians and Russian-speaking inhabitants. 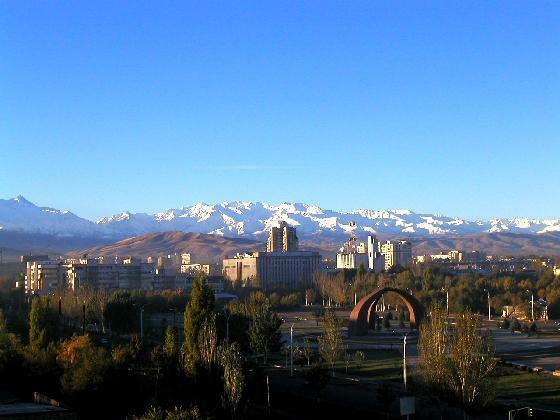 Bishkek is located in the center of the Chui Valley, at the foot of snowy Kyrgyz Ala-Too mountains at an altitude of 750 meters above sea level. The climate is acutely continental. The characteristic feature of the city is the strong layout of streets, which cross at a straight angle only. Since the VII century Bishkek city had been known as Jul settlement (forge fortress). In 1825 Kokand fortress Pishpek was built, it deployed the largest garrison in the Chui Valley. Twice (September 4, 1860 and October 24, 1862) it was captured by Russian troops. In November, 1862 the fortress was destroyed, and two years later the military picket was based on this place. Then the bazaar was formed there. In 1868 Pishpek settlement was found. In April 1878 because of declaring Pishpek the center of the uyezd, it got the city status. In October 1924 Pishpek became the administrative center of the Kara-Kyrgyz Autonomous Region. From May 1925 - the administrative center of the Kyrgyz Autonomous Region. In 1926 it was renamed Frunze in honor of a native of the city, the Soviet commander Mikhail Frunze. Since 1936 Frunze had been the capital of the Kirgiz SSR. 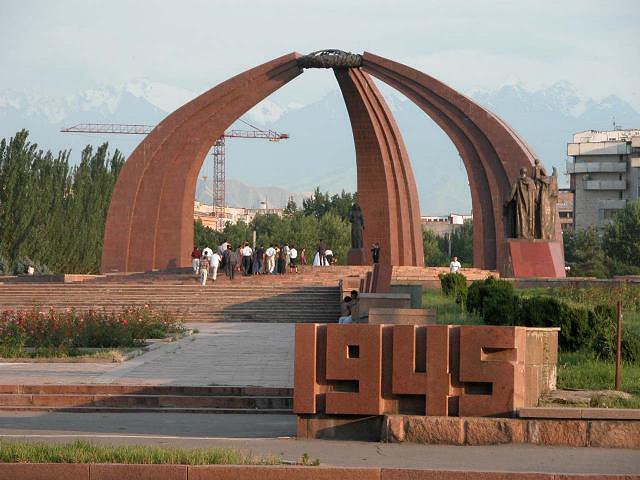 In February 1, 1991, by the decision of the Supreme Council of Kyrgyzstan, the city was renamed Bishkek. According to one version a new name comes from the mythical hero Bishkek-batur, who lived in the area in the XVIII century. According to another version the name originates from the harmony of words Pishpek (first name) and Bishkek (kitchen utensils, a stick for the churning). are located in the city. Theatres: Kyrgyz Opera and Ballet Theatre, Kyrgyz Drama Theatre, Russian Drama Theatre, Puppet Theatre, the philharmonic, Kirgiz film studio. Museums: Historical museum, Art museum, zoological museum, as well as archaeological, mineralogical and geological museums. There is an alpinist camp "Ala-Archa" near Bishkek. There are recreation centers: "Warm Springs", "Issyk-Ata and many others. The city has more than 20 parks, the most famous are: Panfilov Park, South Gate, Flamingo, Ata-Turk Park. In the last ten years numerous centers of gambling and recreation appeared in the city. Dozens of nightclubs, casinos, entertainment centers, sport complexes are in the city. Aquaparks and swimming pools also function in Bishkek.